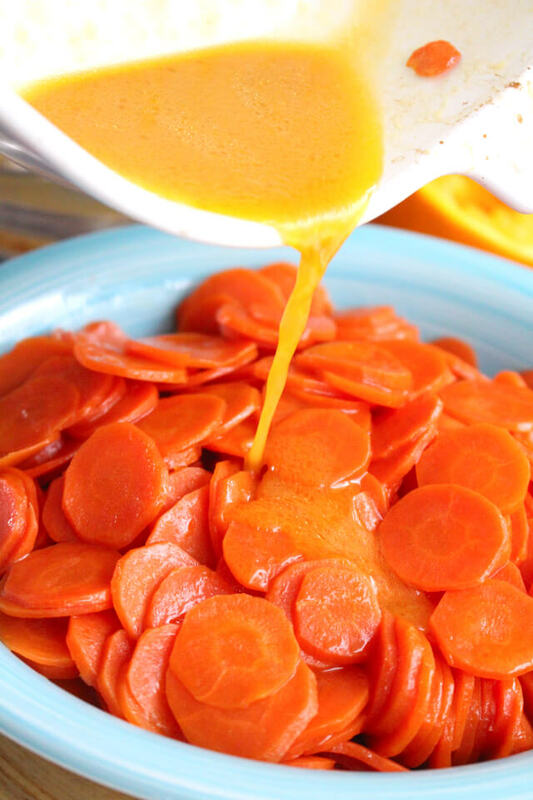 Maple Butter Carrots is an easy to make, four-ingredient, kid approved recipe featuring thinly sliced carrots in a sweet buttery sauce! My husband and I have been hosting Thanksgiving dinner at our house for years and years. One year, we hosted over thirty of our friends and family in our tiny little house. Talk about a full house! The living room was full of nothing but tables and chairs and there was literally no room to move around. Like, at all. It was over the top, crowded, and crazy, but in spite of it all, it was a great, memorable holiday filled with people I love! Now, I'm sure you've probably guessed by now that this Maple Butter Carrots recipe might have something to do with that Thanksgiving. You're right! Naturally, with that many people for dinner, we went the potluck route. Everyone brought a dish so that there was plenty of food to go around. And so that I didn't pull my hair out trying to feed that many people Thanksgiving dinner. My brother-in-law's mother was one of our guests that year and she brought these amazing carrots swimming in a delish butter sauce. 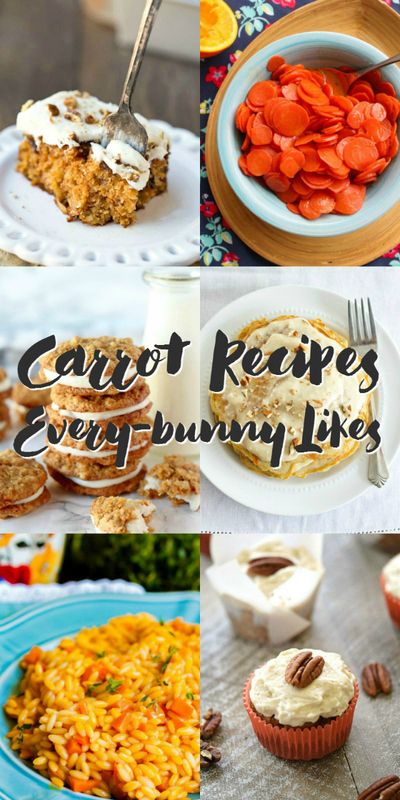 It was her carrots that inspired this recipe! This recipe is a little different than hers. Instead of being sweet, her carrots were all savory with a garlic butter sauce. I am totally in love with that, but I decided to put a sweet twist on mine because I knew my kiddos would adore them that much more! And I was right. My daughter was begging to eat the sauce by the spoonful! 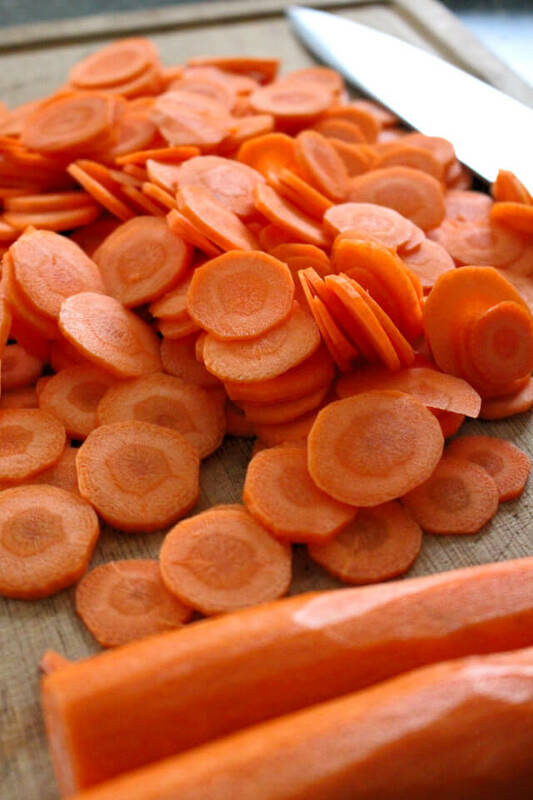 I sliced my carrots super duper thin as a matter of preference using my mandolin slicer. If you don't have a mandolin, you can slice them with a knife, but it will be a bit harder to get evenly thick slices. If you go a little thicker than in the pictures, you'll have to simply cook them a little bit longer until they are tender. Now, just because I keep talking about these carrots in reference to Thanksgiving, don't think they are a Thanksgiving only side dish. 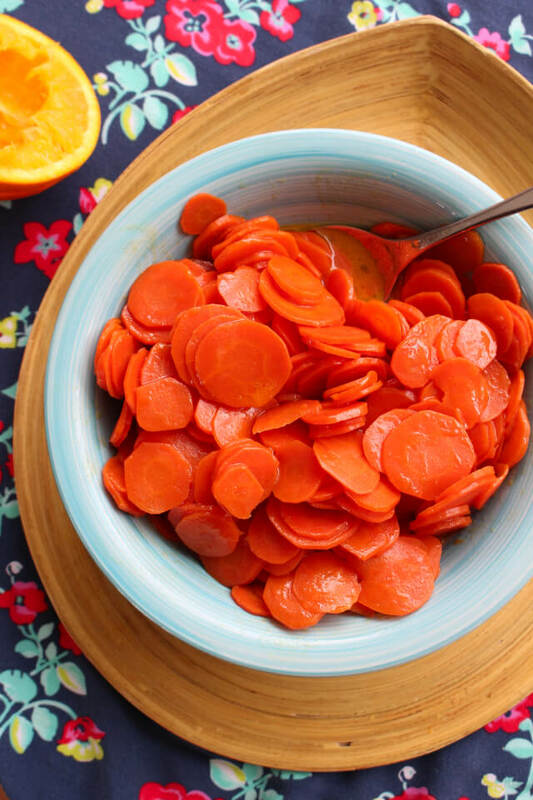 These carrots would be great alongside your ham on Easter, too! Heck, they would be good on a weeknight served with just about any protein. 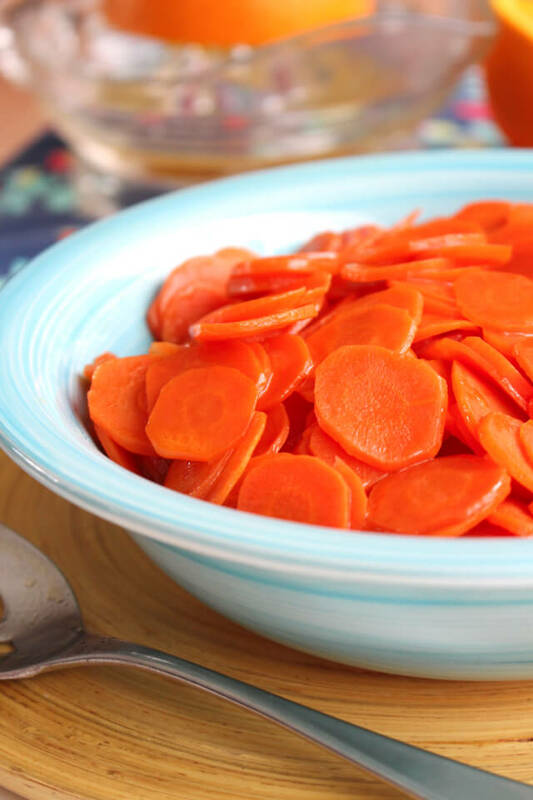 All of my friend in the Feast and Devour Cooking Club are cooking with carrots this month, too. Check out their tasty carrot creations! Preheat oven to 400 degrees. Place butter into a 2-quart glass baking dish. Place the dish into the hot oven for 5 minutes to melt the butter. Stir the maple syrup and orange juice into the melted butter. Add the sliced carrots to the dish and stir to coat. Bake for 40 minutes or until carrots are tender, stirring at least twice during the cook time. Using a mandolin slicer makes quick work of slicing the carrots! This dish can also be prepared on the stove top. Simmer over medium heat stirring often until carrots are tender.